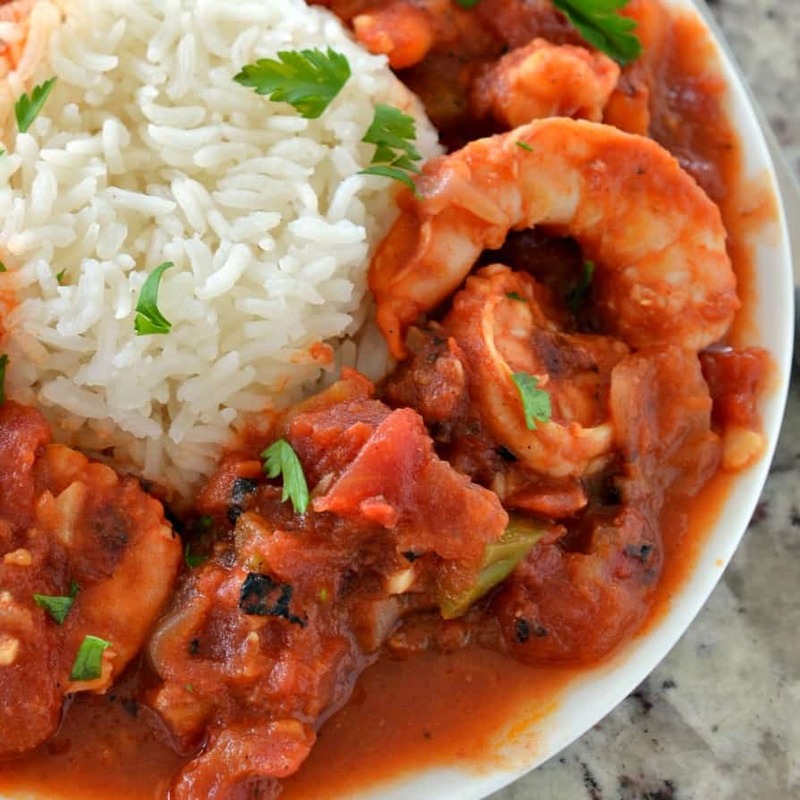 Shrimp Creole is a Louisiana style dish made with green bell pepper, sweet onion, celery, garlic and shrimp all simmered in a tomato base seasoned with creole seasoning and a splash of Tabasco. This flavor packed meal comes together in about thirty minutes making it ideal for any night of the week. 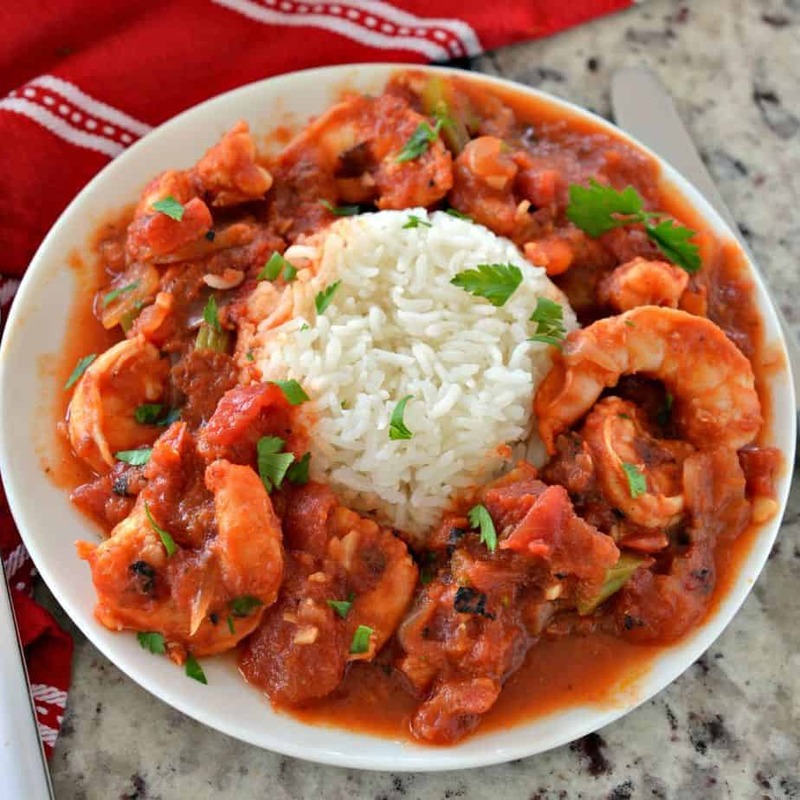 Shrimp creole is such a delicious dish full of so much flavor. Cajun food is one of my favorite regional cuisines. When most people think of Cajun they think super hot and spicy. Cajun cuisine to me is robust with tasty succulent ingredients and spices. 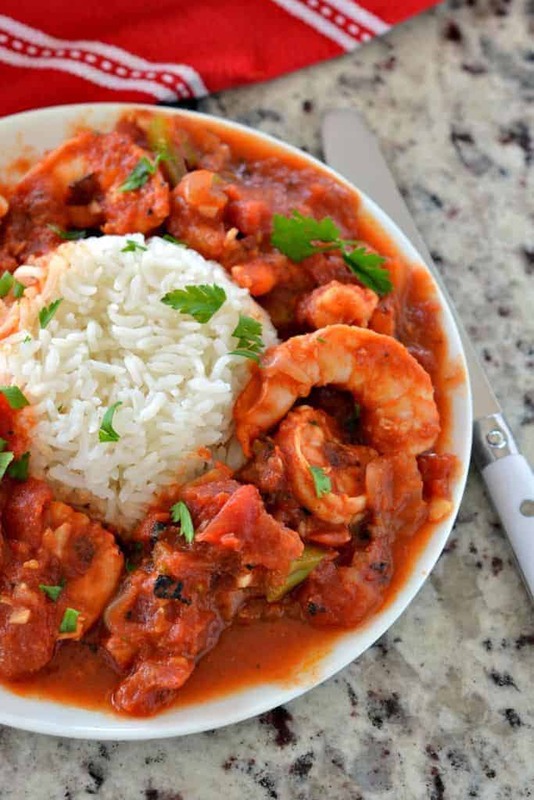 This Shrimp Creole gets plenty of amazing yummy from stewed tomatoes, sweet onions, earthy bell peppers and fresh succulent shrimp. For a complete meal serve over rice with Homemade Bloody Mary Recipe. First heat the vegetable oil in a large skillet over medium heat. Secondly add the green pepper, onion and celery and cook until the onions start to become translucent and lightly browned on the edges. This will take about five to seven minutes. Next add the creole seasoning and garlic. Cook for one additional minute. Stir in the Worcestershire sauce, stewed tomatoes, fire roasted tomatoes, tomato sauce and brown sugar. Cover the skillet and simmer for about twenty minutes to meld all those delectable flavors together. In the final step take the top off and add the shrimp. Simmer for two minutes and season with Tabasco Sauce to taste. Serve immediately over rice. 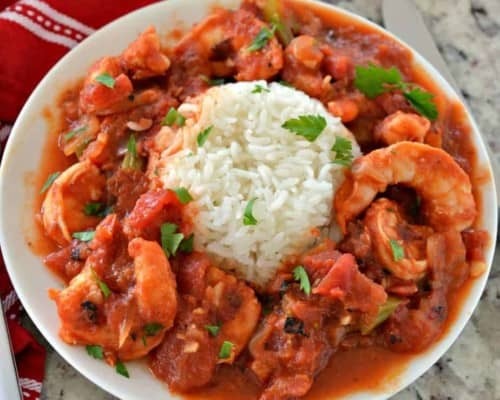 What is the best shrimp for Shrimp Creole? 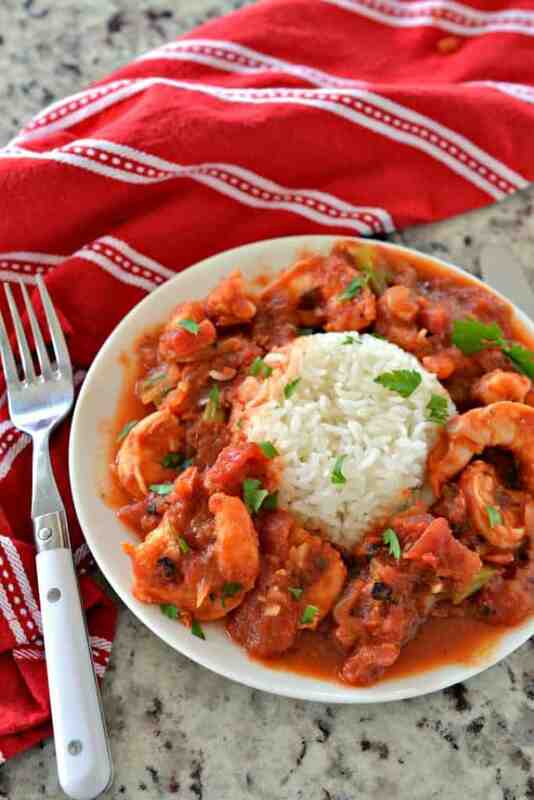 I purchase 21-25 count per pound wild caught shrimp for this creole recipe. I really prefer the wild caught shrimp over the farmed raised. They are healthier and taste better. Unless you live near saltwater chances are they will be frozen or previously frozen then thawed for sale. Sometimes they are peeled and deveined which saves you a little bit of time. These shrimp are the perfect size for this recipe and are super tasty. Purchase the vegetables as fresh as you can. If you have fresh garden tomatoes that you canned use them. Sun ripened garden tomatoes have an abundance of flavor. If you have a sensitive palate certainly add just a touch of Cajun seasoning before you simmer the tomato/veggie mixture. Then season to taste with more seasoning before you add the shrimp. If you are diabetic or simply watching your sugar skip the brown sugar. It is a light touch of sweetness and chances are pretty good that you prefer things less sweet. Use wild caught shrimp not farm raised shrimp. Other Louisiana Cajun recipes you will love! 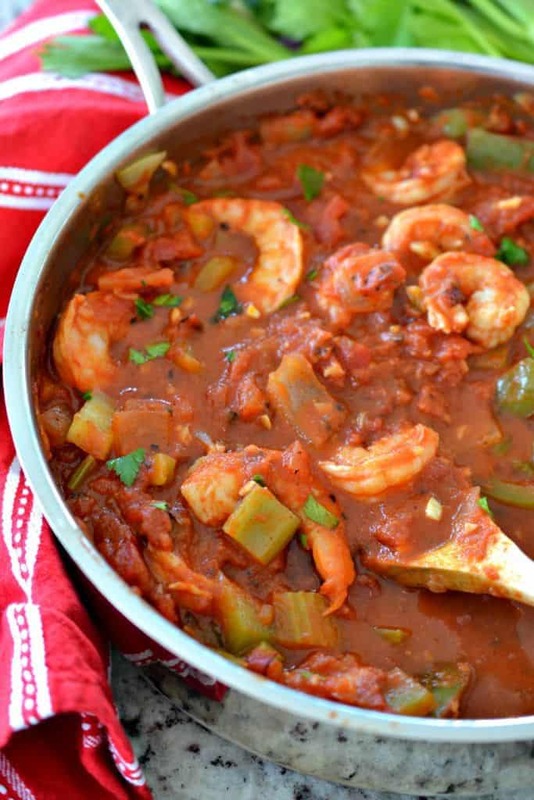 Shrimp Creole is a Louisiana style dish made with green bell pepper, sweet onion, celery, garlic and shrimp all simmered in a creole seasoned tomato base. Heat the vegetable oil in large skillet over medium heat. Add green pepper, onion and celery. Cook until the onions are translucent and lightly browned; 5-7 minutes. Decrease heat to low. Add garlic and creole seasoning; cook for 1 minute. Stir in the Worcestershire sauce, stewed tomatoes, fire roasted tomatoes, tomato sauce and brown sugar. My husband would be all over this one! My family loves shrimp! This looks perfect, can’t wait to make it for dinner next week! Absolutely love this recipe and so easy to follow ! These are calling my name! I should make them this weekend! Sounds really amazing! Love how easy to make and incredibly delicious, so excited to try this! Love these flavors! Such a delicious dish!